Many of you know that in Taiwan, they have tea competitions. 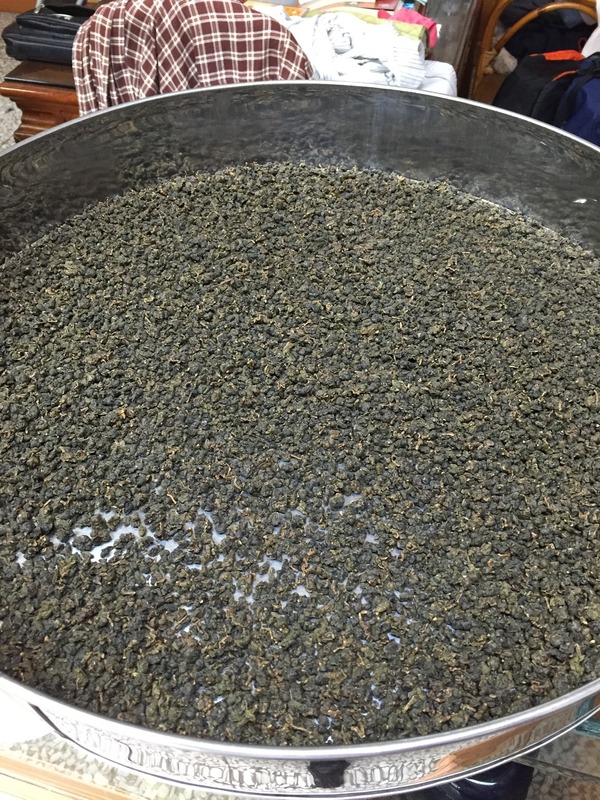 The basic idea is that farmers would submit sample teas (ranging from 5 jin to 20 jin – one jin is 600g, depending on where, what, etc) for the competition. These got started by 1930 or so under Japanese rule. These days, some allow multiple entries while others only allow single entry per member of whatever association is holding that competition. The teas are judged anonymously, and then after multiple rounds of tastings a winner is declared with multiple winners of lower ranks underneath. Some teas are thrown out as not being good enough (and returned to the farmer). The teas that win a certain grade will then be packaged in sealed containers inside sealed boxes with dated labels, and then they would be returned to the farmers to sell. The whole thing was supposed to encourage farmers to up their game and create better teas, and top winner for the big competitions, like the Lugu Tea Farmers Association one, could fetch prices of over 30,000 NTD (about 1000 USD) per jin in that special packaging. Compared to a normal price or about 3-4,000 NTD a jin for a top grade Dong Ding tea, that’s a big upgrade. For those 20 jin of tea the farmer is making 10x the normal amount. It also helps his sales for other stuff. Farmers who win the top prize can get a big wooden plaque to commemorate the win, and they frequently hang these in their shop to showcase their abilities. Some have so many they just stack them on the side of room because they don’t have enough space to hang all of them. So this is all great right? Well, not so fast. There are troubles beneath the surface, some of which were topics of conversation between myself and some tea farmers/sellers that I have talked to in the last week I spent here in the middle part of Taiwan. The first is this: what you see is not really what you get. For example, when you see teas coming out of the competition for the Lugu Farmers Association, does it mean that all the tea came from Lugu? No, not at all. Many entries, if not most, use teas from higher elevation as the base for their entry. In fact, if you use local Lugu tea, you’re probably going to lose because the low elevation tea from Lugu simply don’t stand up to the much higher quality teas from higher areas. The thickness of the tea, the aroma, etc, are not up to normal judging standards. In other words, you can’t compete. So, when you end up with, say, Lugu Tea Farmers Association competition tea, know full well that the tea might be Dong Ding style (higher oxidation and roast) the base tea is probably not from the area. Then you have the silly part – many (though not all) competitions allow multiple entries. So what happens is that a farmer can enter the same tea multiple times. This has a cost – when you submit 21 jin of tea, they only give you back 20 jin + 200 grams. They take a bit of the extra as a bit of profit, plus whatever entry fee they charged. Today someone told me that he entered a competition with ten entries, all with the exact same tea. Why? Because you never know. With just one entry, if you got unlucky and the 3g sample they picked out from your bag isn’t so great for whatever random reason, then you will get kicked out in a flash. If you were unlucky and got lined up (randomly) between two really good entries, then your tea is going to look bad in comparison. For his ten entries, he said three got rejected and the rest, some scored higher and some scored lower. It’s all a crapshoot to a certain extent. The top prize is going to be excellent, the top few levels are going to be pretty good, but there’s still a fair amount of randomness in there. As a buyer, there’s definitely some value in these competitions – like I said, the quality of the tea that won a high level prize is going to be pretty good. You also need to pay through the roof for that – it’s going to be expensive, more than the normal stuff anyway. At the lower grades (three or two plum blossoms, for the Lugu competition) they are going to be comparably priced to the normal price for these teas. It’s a bit of an assurance, in some ways. At the same time though, there are problems. First of all, you don’t really know exactly what you’re getting – unless you happen to be with the guy who made the tea, you’re not going to get to sample it. So you’re buying blind, really. There’s also that price premium, which for a normal drinker is really not worth paying – you can usually get good quality tea for less money if you know what you’re doing. Of course, since all oolongs look similar, it’s quite hard to do in practice, especially when it’s through multiple layers of middlemen and repackaging. People buy competition tea partly for this assurance. Partly though, it’s also for gifting – when you gift someone a box of unopened competition tea you’re basically telling them exactly how much you paid for the tea, since the prices are set. There’s also the even more confusing competition for things like aged oolong. Here it’s really a crapshoot – you don’t even know what style of tea you’re getting. There are so many possible permutations – original roast level, age, area of origin, etc – none of which will be apparent to you (or anyone else, for that matter). It’s one thing to have aged competition tea from the past that are now old, it’s another to have a competition for aged tea. Unless you can sample from the source (that’s what the extra 200g is for) buying aged oolong competition tea is a fool’s errand. So not only that they have to make good teas, they also have to know how to play the game. Is the judging process still the same as it has always been done since the 1930’s? Kinda like academic tenure for the same journal article re-written and submitted six times. I also heard this kind of criticism in Nantou. I think one reason Taiwanese tea growers and vendors disparage competitions is that they are the closest Taiwan has to a tea grading system and standardized quality-price ratios. Many actors in the tea industry thrive on information asymmetry and market power: commoditization is against their interests, as it limits their potential for profit. Competitions may be flawed (all standardized testing systems are). You can certainly argue a terroir-specific competition for Dong Ding teas would be interesting, since as you pointed out Lugu competition teas are often from the highlands or even Vietnam. Some teas (like mixiang style oolongs) are not covered by competitions. Personally, I’d like a competition for organic or pesticide-free teas. As you pointed out, not being able to taste the teas before you buy them is another drawback. Still, having seen competition judges and TRES specialists at work, I have utmost respect for their tasting skills. It may be possible to game that system, but it is incomparably easier to influence a single taster when you know a tea inside-out and effectively control tasting parameters. All in all, I think competition teas are a good value, low-risk option with great aging potential. I think the lower grade competition tea are indeed fair value. Buying first prize is usually not – because the premium is very high but the quality difference is small. As always, thank you for this post, Marshal! I need to write you back–in the process of setting up a tea business in Kwai Chung. Once I’m all set up, my invitation still stands and I’d be greatly honored to have you over.